Alert! April incentive for NEW Norwex consultants! Make the decision today to start your new business with Norwex. You'll be helping yourself and others create a healthier home with our eco-friendly products. It is fun and flexible to be a part of Norwex. Since you're the boss, you can work as much or as little as you want and set your own schedule, all while earning 35% commission and the opportunity for monthly incentives and bonuses. During the month of April, Norwex is offering an extra incentive for those who join my team as an Independent Sales Consultant. 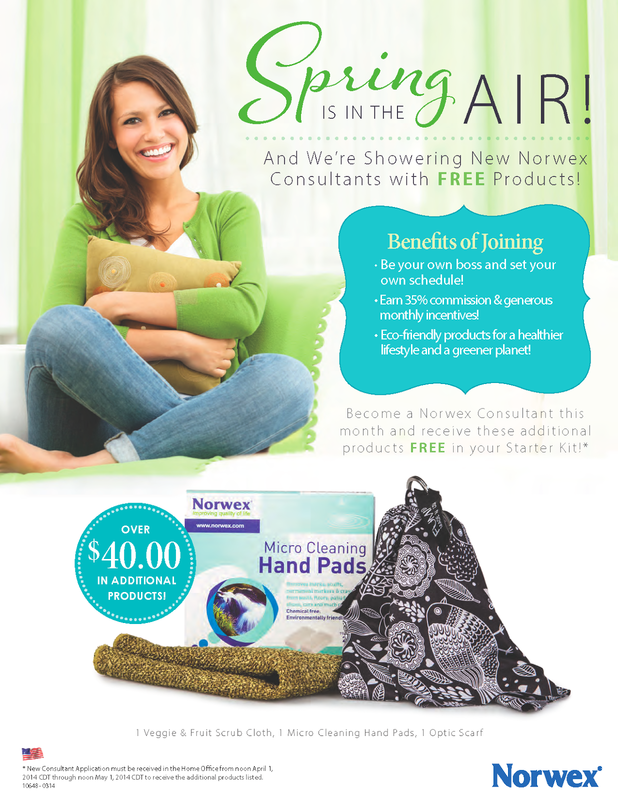 You can read all the details about joining here: http://www.fastgreenclean.com/2014/01/join-my-norwex-team-and-start-your-new.html BUT during April, you'll also receive a BONUS $40+ worth of products - one Veggie & Fruit Scrub Cloth, one Micro Cleaning Hand Pads (2/package), and one Optic Scarf. Contact me TODAY if you want to take advantage of this generous offer! 2014 CDT through noon May 1, 2014 CDT to receive the additional products listed. What is under your kitchen sink? Mine has vinegar, Norwex Cleaning Paste, trash bags, a jar of kitchen grease, and Norwex Super Jet dishwasher detergent. No toxic cleaning chemicals here! Contact me if you're interested in making over your cleaning supplies - I'd love to help you take a step towards a healthier home! This is what's under my kitchen sink! Norwex! No toxic chemicals here.